Download "Along with some skill in writing in heteromedia environments, I hope you'll experience:"
3 requested, and we may discuss some in class. 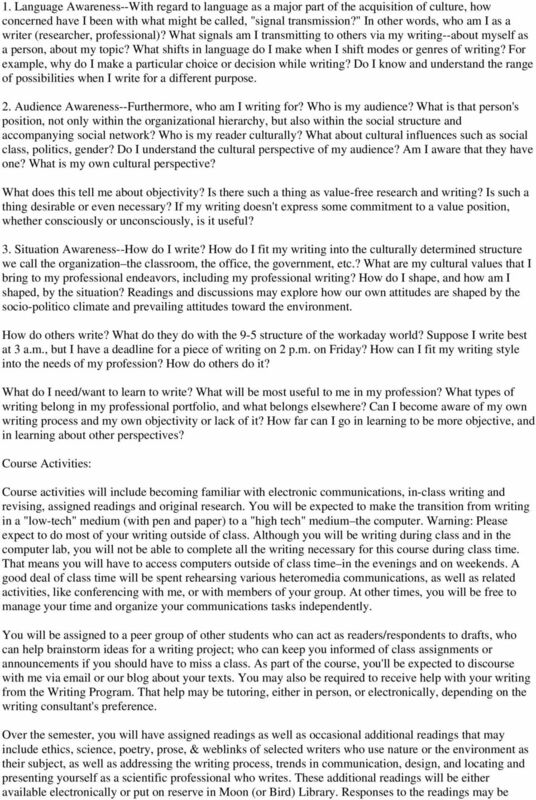 Description of Assignments Class Discussion & Class Minutes Participate in all oral and written class discussions. At the beginning of each class, we ll read the minutes from the previous class, engage in a commentary (questions, insights, observations), and then post it to our blog. We ll alternate responsibility among class members for taking, reading, and discussing class minutes. Comparative Analysis Summary The comparative analysis is a summative evaluation of a scientific, environmental, or other type of text. Each student will take a turn discussing a selection or bringing to class an example of an assigned text: environmental issue, environmental policy statement, non-fiction book, scientific article, etc., ready to share and discuss with the group, elements of writing: the chosen genre, the purpose, audience, language, tone, readability, etc. of the text and whether it does its job of communicating its message to the reader successfully or not. 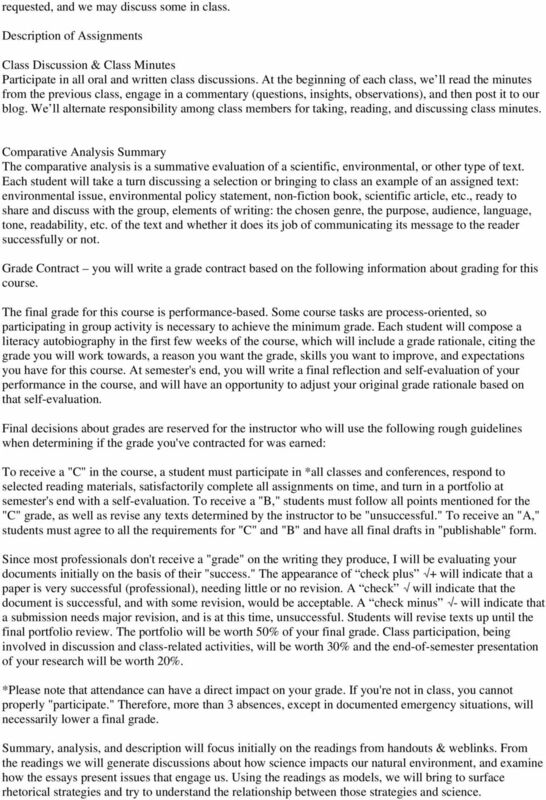 Grade Contract you will write a grade contract based on the following information about grading for this course. The final grade for this course is performance-based. Some course tasks are process-oriented, so participating in group activity is necessary to achieve the minimum grade. Each student will compose a literacy autobiography in the first few weeks of the course, which will include a grade rationale, citing the grade you will work towards, a reason you want the grade, skills you want to improve, and expectations you have for this course. At semester's end, you will write a final reflection and self-evaluation of your performance in the course, and will have an opportunity to adjust your original grade rationale based on that self-evaluation. Final decisions about grades are reserved for the instructor who will use the following rough guidelines when determining if the grade you've contracted for was earned: To receive a "C" in the course, a student must participate in *all classes and conferences, respond to selected reading materials, satisfactorily complete all assignments on time, and turn in a portfolio at semester's end with a self-evaluation. To receive a "B," students must follow all points mentioned for the "C" grade, as well as revise any texts determined by the instructor to be "unsuccessful." To receive an "A," students must agree to all the requirements for "C" and "B" and have all final drafts in "publishable" form. Since most professionals don't receive a "grade" on the writing they produce, I will be evaluating your documents initially on the basis of their "success." The appearance of check plus + will indicate that a paper is very successful (professional), needing little or no revision. A check will indicate that the document is successful, and with some revision, would be acceptable. A check minus - will indicate that a submission needs major revision, and is at this time, unsuccessful. 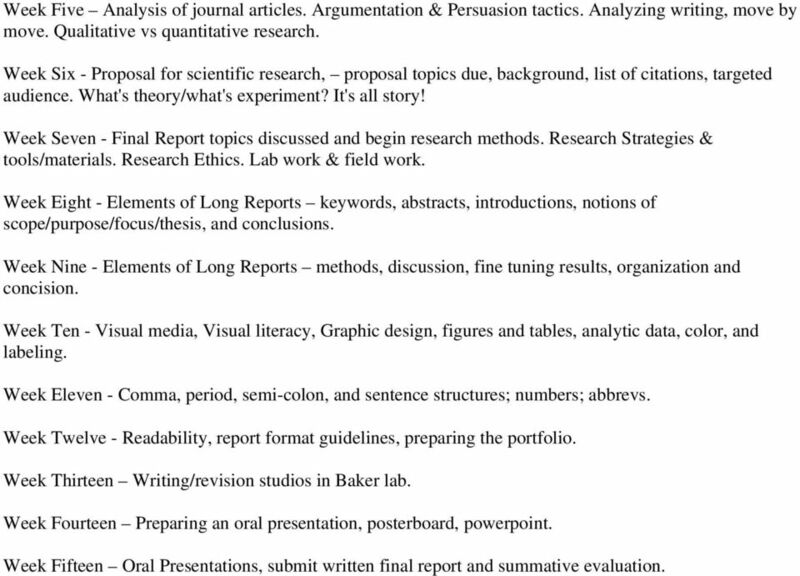 Students will revise texts up until the final portfolio review. The portfolio will be worth 50% of your final grade. Class participation, being involved in discussion and class-related activities, will be worth 30% and the end-of-semester presentation of your research will be worth 20%. *Please note that attendance can have a direct impact on your grade. If you're not in class, you cannot properly "participate." Therefore, more than 3 absences, except in documented emergency situations, will necessarily lower a final grade. Summary, analysis, and description will focus initially on the readings from handouts & weblinks. From the readings we will generate discussions about how science impacts our natural environment, and examine how the essays present issues that engage us. Using the readings as models, we will bring to surface rhetorical strategies and try to understand the relationship between those strategies and science. 4 Memos status reports are a type of short report used in the workplace to report to a client or a manager, where a particular project is in terms of start up and completion. Students will regular status reports to update the terms of their grade contacts. Proposals students will learn how to use a direct and/or indirect approach when writing a proposal for their final topic. The final topic will be discussed in class, but will be defined and described in a formal proposal. Final Report students will draft a formal final report based on general guidelines for these documents and following the requirements for good written communication considering purpose, audience, socio-political attitudes, etc. This report will be about a topic approved by me, and will be submitted in sections (abstract, table of contents, illustrations, introduction, body sections, conclusion, bibliography, etc,) during the second half of the semester, with the final version due the last day of class. That way, components can be revised in a timely fashion. Technical elements some elements of good technical writing will be discussed and rehearsed. We ll examine graphic display of information (e.g., charts, graphs, etc. ), talk about visual literacy, and practice representing some of our data graphically. Also, we ll analyze the readability factors of our final report using the Gunning Fog Index, and practice making more educated judgments about reading levels. Oral Presentation the elements of a good oral presentation will be discussed and rehearsed in the presenting of your final report to your professional/lay persons audience. 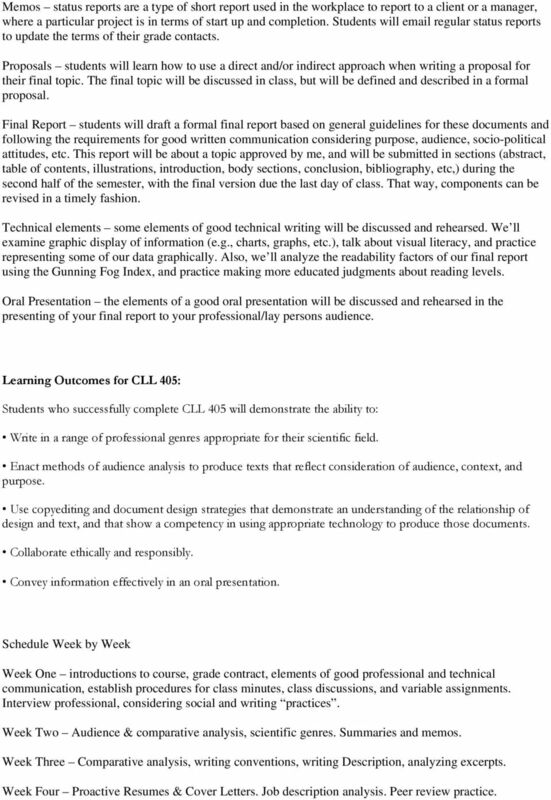 Learning Outcomes for CLL 405: Students who successfully complete CLL 405 will demonstrate the ability to: Write in a range of professional genres appropriate for their scientific field. Enact methods of audience analysis to produce texts that reflect consideration of audience, context, and purpose. Use copyediting and document design strategies that demonstrate an understanding of the relationship of design and text, and that show a competency in using appropriate technology to produce those documents. Collaborate ethically and responsibly. Convey information effectively in an oral presentation. Schedule Week by Week Week One introductions to course, grade contract, elements of good professional and technical communication, establish procedures for class minutes, class discussions, and variable assignments. Interview professional, considering social and writing practices. Week Two Audience & comparative analysis, scientific genres. Summaries and memos. Week Three Comparative analysis, writing conventions, writing Description, analyzing excerpts. Week Four Proactive Resumes & Cover Letters. Job description analysis. Peer review practice. 5 Week Five Analysis of journal articles. Argumentation & Persuasion tactics. Analyzing writing, move by move. Qualitative vs quantitative research. Week Six - Proposal for scientific research, proposal topics due, background, list of citations, targeted audience. What's theory/what's experiment? It's all story! Week Seven - Final Report topics discussed and begin research methods. Research Strategies & tools/materials. Research Ethics. Lab work & field work. Week Eight - Elements of Long Reports keywords, abstracts, introductions, notions of scope/purpose/focus/thesis, and conclusions. Week Nine - Elements of Long Reports methods, discussion, fine tuning results, organization and concision. Week Ten - Visual media, Visual literacy, Graphic design, figures and tables, analytic data, color, and labeling. Week Eleven - Comma, period, semi-colon, and sentence structures; numbers; abbrevs. Week Twelve - Readability, report format guidelines, preparing the portfolio. Week Thirteen Writing/revision studios in Baker lab. Week Fourteen Preparing an oral presentation, posterboard, powerpoint. Week Fifteen Oral Presentations, submit written final report and summative evaluation. University of North Texas at Dallas Fall 2015 SYLLABUS TECM 2700-001 Technical Writing (3 hrs) Department of Languages and Communication Division of Liberal arts and Life Sciences Instructor Name: Dr.
English 100 or English 100Plus? 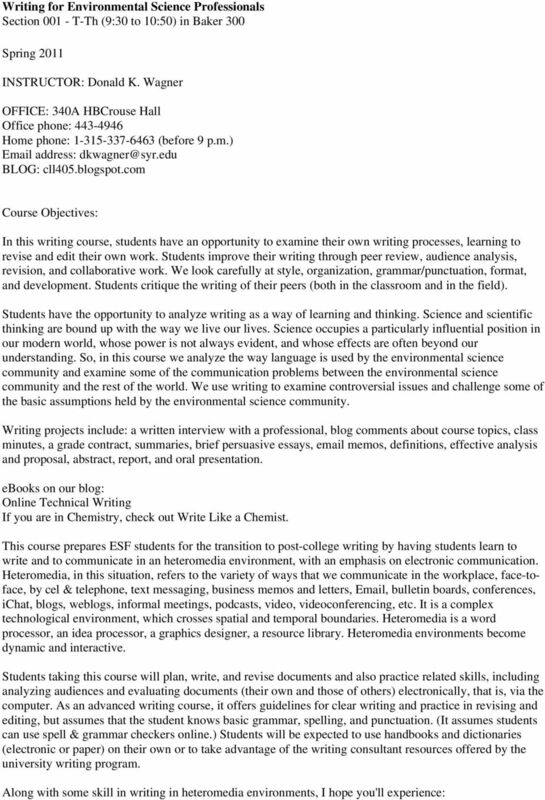 ~~~~~~~~~~~~~~~~~~~~~~~~~~~~~ A Guide to Choosing the Right First-Year Writing Course At Eastern, a key component of our mission is an emphasis on communication skills. Business Communication 206 Business Writing Instructor: Marcy Leasum Orwig, PhD Office Hours: M/W 10-12 & T/H 10-11 (or appt.) Email: orwigml@uwec.edu Office: 417 Schneider Textbook Rentz, K., Lentz, P.
Course Description: Required texts: Course Requirements: Course evaluation will be based on a number of different elements described briefly below. Research Proposal Assignment Assignment: Overview This assignment asks you to produce a formal proposal of at least 1200 words describing the research project you intend to pursue for the rest of the quarter. ENGL 210 focuses on writing as it is developed and used in workplace contexts, rather than in an academic or classroom setting.